A quarter century of love and loss distills life to its foundation. Driving near my home not long ago, I observed what I first thought was a plant in the road — something a bit odd, certainly conspicuous. I surmised that an errant palm frond had blown onto the asphalt. As I neared it, I noticed that what I approached was not one piece but several, and the smaller parts were rolling. I slowed. The truth was unsettling: the palm frond was a possum, and those “smaller parts” were her young. It wasn’t squeamishness that I felt. It was a surge of regret over such a violent end. The contrast between a mammal carrying her babies — a storybook scene — and then upended into roadkill made my lips part. I’m sorry. It has been a quarter century since I graduated from high school. I think of myself 25 years ago. I would’ve been pained by the possums then too. I have, for better or worse, maintained my concern for the doomed suburban marsupials of the world. I like to believe there is a certain tenderness revealed when we pause to study what stirs near us. I see this in a child’s furrowed brow over a drawing, a friend’s patience through the belaboring of a story, and moments both pedestrian and a bit ugly: the lament when something as humble as a family of possums dies. 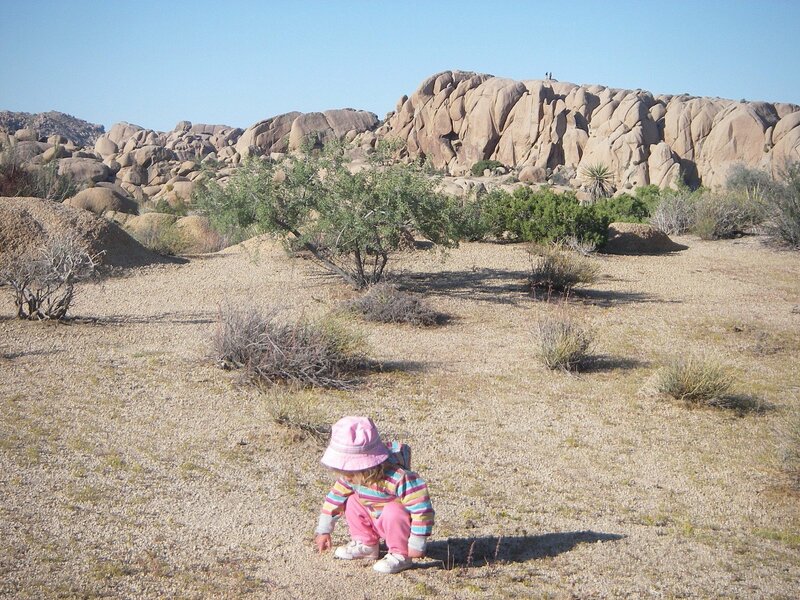 The spring before my first child turned two years old, she and I were up early at a campsite in the desert. My daughter still had the look of a baby, her limbs chubby, her wide stance protecting her from stumbling. Alone as the sun rose, we were greeted by a jackrabbit. The animal, which I had never spotted before, was eye-catching with its impossibly long ears. I pointed how a young child would point. Oh look! But quietly. Quietly. The moment passed, the three of us, and then the jackrabbit continued on. As I reach this 25th anniversary of my high school graduation, a letter to my younger self would commence not with cringing or with caution. I would begin this letter by assuring myself: you will keep your attention to the smallest things. You will listen to the beings with no voices and cup your hand upon sight of the things that nest. Those that peep, the rarest creatures, the dawn collective — all will be safe with you. Be proud of this. A tenet will grow central to your life: there is lasting worth to wonder. Believe in your own wonder. Seek more of it. Cherish your capacity to marvel. In the Eastern Sierra Nevada mountains, there exists a national monument where one can find a wall of basalt columns that look as if they are stacked by machines, and the columns are all perfect hexagons. They are hexagons. Ice and heat and time have conspired to form them, requiring as much suspension of disbelief as does the giraffe with a six hundred pound neck. The “Devil’s Postpile” is a wonder of this world. It is important and disarming and jaw-dropping if we let it be. The youngling that knows to cling to its mother’s back is important and disarming and jaw-dropping if we let it be. The loss of either may represent a loss of wonder. When I was 17 years old on that late May day in 1992, I did know the spark of wonder. That was already there. Today I would tell my young self, as she struggles to keep her honey-blond hair looking nice under that mortar board, that her hair looks fine. This is what life is about to bring: you will fly away and you will wonder more, and you must be grateful for that. Because what will be added to your understanding over time is that wonder is the core of love. Wonder is the raised heart rate and the irrepressible grin. Wonder is arms outstretched. It is the soaring pride. Wonder is the shaping of oneself into comfort, only for the sake of another. The discussion cannot end there. Wonder and love are not without pain. They can make a grip tighten. They can transform into worry. They can force us to realize that we are small, and we are but one. They can make us grieve. But wonder and love will be wide and strong and proud and beautiful. So to my 17-year-old self, I whisper: believe in a world wide open. Yes, it is true that there will be a day in college when you will forget to rinse the conditioner out of your hair and you will sit through two classes until your friend asks why your hair is “still wet” hours after your shower, and you will replace wonder that day with a deep mortified horror. That will happen too. Be confident that life wends through varied terrain and you must forgive it; over and over you must forgive it. But you are, as is every person and every creature, the favorite of several luminous points in the midnight sky. Those stars that have chosen you shine only for you. Go wonder. Go love. They — and all that comes with them — are your purpose.